The Schedule Area - where time bars are created and interacted with and through which developers define the type of Gantt style end-user interaction, varying degrees of accuracy and supporting information that can be surfaced. The Multi Column List View - where developers define style and presentation of the resource data. The List Items - which originate in the List View area and carry through the Scheduling Area for contiguous representation of Resources and the tasks and roles assigned to them. The Ruler Area - which offers direct time line customization for creating plans and schedules based on time types and time lines of Seconds to Years. The Time Bars - which reside in the Schedule Area that complete DBI’s unique Gantt Style, intuitively interactive, Drag and Drop planning and scheduling surface. 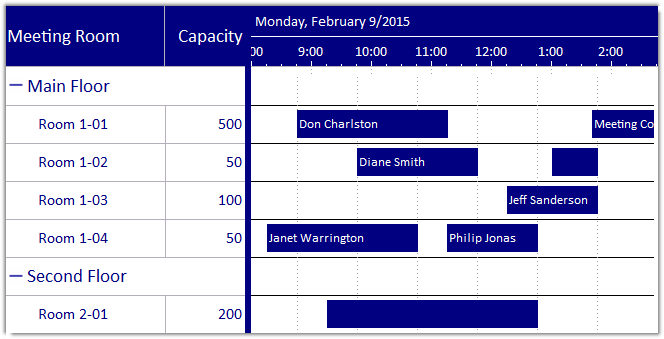 Creating drag and drop, Gantt - style multi resource scheduling solutions now becomes second nature. The combination of Solutions Schedule and the appointment scheduling controls found in Studio Controls for COM provide a complete set of scheduling resources.